Don’t push them into the shop! Usually I save this conversation for closer to Father’s Day, but recently I’ve been feeling like I need to bring it up sooner than later. A frequent question I’ve received over the years, and a topic I see come up all the time in forums and on social media, is fellow woodworkers asking how they can get their kids as passionate about woodworking as they are? For the record, when Madison and Aiden were very young and the woodworking bug first bit me, I dreamed of the day when they’d be old enough to join me in the shop for hours of building and sharing a common passion in woodworking. But as the kids started getting older I quickly realized they had next to zero desire to join me in the shop. I’ll admit this kind of broke my heart at first, but rather than getting frustrated and constantly trying to cajole them into the shop, I just accepted the fact and moved on. You see, when I was growing up it wasn’t my dad who was the woodworker (honestly he could barely hang a picture frame at times,) instead it was my grandfather. For myself, time in the woodshop as a kid was spent standing alongside him watching as he repaired furniture they picked up while antiquing or making simple, rudimentary pieces for around the farm he owned. And while he did build the occasional stool or bookcase, most of his woodworking was limited to cutting out the shape of a pine wood derby car for me when I was in Cub Scouts or a simple box to carry my Star Wars action figures home in when I came to visit. Aside from holding the occasional tool and handing it too him when he needed it, I was never his apprentice in anyway. In fact, I would consider myself more of a side-kick, or partner-in-crime considering some of the junk-food we snuck into the shop or tricks we hatched in there to pull on my grandmother. Time for me in the shop as a kid wasn’t about learning a trade, or learning to handle a tool like a seasoned pro. Instead, time in the shop simply meant I got to hangout with someone I loved. It’s now almost two decades since my flame for woodworking was first ignited, and while I can’t imagine NOT doing it in some form or another, I do remember a time in my life (coincidentally the same period both my kids are in right now) when my hobbies and passions were so far removed from anything to do with woodworking that I almost don’t recognize myself. 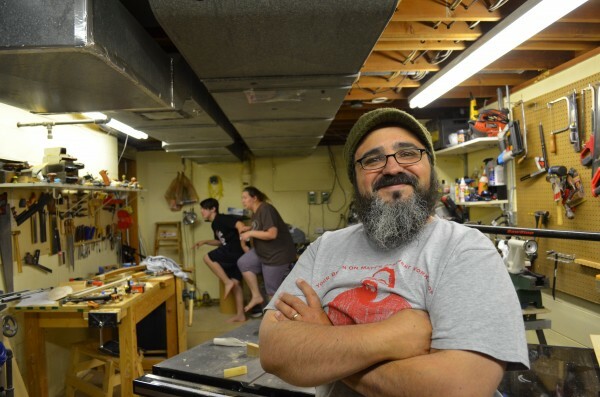 So what I’m really trying to say is if you’re really truly hell-bent on making your kids love woodworking like you love woodworking, by forcing them into the shop to work on projects, you’re more than likely setting yourself up for failure. In all likeliness they might possibly learn to “like” it at best or even become “somewhat proficient”, but more than likely they’ll never carry the same flame of passion for it that you do, and maybe even come to resent it. As one parent to another, do us all a favor and let your kids discover for themselves if woodworking (or any other hobby) is right for them. They may show an interest at first, but if it fades away it’s not the end of the world. if they’re anything like me and countless others it’ll come back when they’re older, and really interested more-than-ever, to spend time with you. And one last thing, as a dad, never refer to spending time alone with your kids as “baby-sitting” that just shows you have actually have very little interest in being their parent and instead see it as a job. Right On Matt. Couldn’t agree more. My daughter, who is now almost 7, loves coming in the shop. She has her own little bench and some tools which I have provided for her. Just so she can have her own space to do what she wants, when she wants. I help her when she asks, or when I see she is having issues. But, I have never forced anything on her. Its just a time for her to explore things and learn to play with tools, glue, wood, nails, etc…. I was forced to do things when I was younger and it never resulted into a passion, usually the opposite happened. I just hope one day she can look back to fond memories of being in the shop with me just hanging out. That is really my only goal. Billy I’m really happy to hear others agree with this idea of letting them find their own way into the shop. My own have ventured down once in a while and taken a very slight interest when they did, but just like you, my only goal is the fond memory of being with dad. I have two boy- the older one couldn’t care less about the shop and the other has already eclipsed (at 15) the old man in ability and vision. He has made a scrollsawn wooden gear clock and a second one is 3/4 complete. His current outlet is glass sculpture (who doesn’t like fire?). He will be spending his future time in the shop creating from the medium of his choice, but exposure to many crafts and materials is vital to allowing him to grow and build. I absolutely agree Eric! I love it when my kids were younger and curious. My daughter has tried several mediums, but currently photography is her poison and she’s amazing! My son was a Lego-maniac and couldn’t stop building the most amazing things. He’s now more interested in role-playing games and is actually exploring in varying degrees writing and film-making. In the end, all that exploration will add up to something amazing, and if not, at least they’ll have tried. Thanks for sharing your sons’ experiences. Great wisdom from Matt’s Basement Workshop! My philosophy runs close to yours. Good to see you again and thanks for sharing! Thanks Todd! It’s a slow return, but I’m excited to have more time again to start sharing. Good words. My experience is that my boys weren’t interested in my mechanics or woodworking until they were adults. Before that it was mostly making the occasional wooden sword and such. Now my oldest boy is a wood shop teacher in a high school. And my youngest comes to me when his car doesn’t work. So just because they aren’t interested when young doesn’t mean they never will be. But you said it well, they may never be interested and that’s okay. It’s funny how an activity that was “something only my dad does” becomes an activity that I don’t mind doing the older I get LOL! Thanks for sharing! I don’t have kids, but I’m a great uncle who has a 3, 5 & 6 year old niece and nephews. My advice is to take them to Home Depot the first Saturday of every month. They have free projects for little kids every month. You can’t beat it. The kids will have a ball. They also get a Home Depot orange apron and a pin for every project. My brother’s kids keep losing them, but I’ve seen kids with 15 or more pinned on their aprons. I’m not sure who has more fun every time, the kids or me. I love visiting on kids’workshop day, all that hammer pounding cracks me up! My grown daughter is showing interest in scroll sawing. My grandkids love being in the shop (for short periods). I have devised simple projects that they can build when they reach a certain age. I supervise and assist them with using a hand saw, rasp, brace & bit, sanding blocks, glue and clamps. My oldest granddaughter made her first snowflake this past December with the scroll saw. Its a great feeling to share and learn with the next generation. Great message Matt. I have a 20 year old daughter in college who is a theater major, which isn’t a surprise since I worked in the “Biz” for over thirty years as a stagehand. I was primarily a shop guy building stage scenery. When the economy tanked a few years back I was unemployed so i volunteered at my daughter’s high school teaching scenery design and construction to the kids in the drama department in which my daughter was involved. At that time she showed very little interest in wanting to learn anything about building things because she wanted to be an actor. Well i guess the apple fell closer to the tree than I thought because this past quarter at college she took a tech theater class where she had to put 30 hours in for credit at the scene shop, it was her favorite class. She is slated to be the “Master Carpenter” for the spring quarter production of “As You Like It” and I couldn’t be prouder of her. I’m hoping I can spend some time with her in my shop when she’s home over spring break so I can teach her some scene shop tips and tricks I picked up during my time on the shop floor. Hell maybe someday she’ll even make it into the IMDB like her old man. Keep up the great work Matt. Love the message and the video. Fortunately for me, I have four boys and all but the oldest have an interest in woodworking. Well, that’s not exactly true, he want’s to learn to make a violin since that’s his instrument of choice. They are 12, 9, 6, and 3 years old. What is unfortunate is that I only have the one workbench and four kids, that’s including me; that want to do something cool on it. My 9 year old wants to build the Nicholson workbench, and now we have everything but the lumber to do so. What’s interesting is that he wants this as his birthday gift, oh, and a Veritas side rabbet plane to clean up his dados. We are also an all traditional hand tool workshop. With the four boys, I spend more money on food than on tools. Each kid wants a set of hand planes. Thanks for all the work you put into the site and videos. I work in IT for a living but my kids always introduce me to their friends as a woodworker. The only things I have built are a crappy workbench, low sawhorses, regular sawhorses, English sawbenches, and the fence. So I’ll start by saying that I’ve been a woodworker much… much longer than I’ve been a parent and that my passion for being a good dad to my 14 year old son is obsessive, to say the least. It’s simple… I want to be all the things my own dad wasn’t. I had taken a break from woodworking for several years to focus on the boy, as I affectionately call him from time-to-time and as he’s grown older, I have grown in ways I never could have imagined. Ultimately, watching him grown and trying to steer him in the “right” direction, I’ve spent a lot of time searching my own past for experiences to offer him that will, hopefully, provide him with, at the very least, a curiosity about things that seem to be going away like the ability to use power tools, change a tire, start a fire and cook a multi-course meal. I really dig your post and I think it resonated when I read that your grandfather was your initial access point into this world. My grandfather was a master craftsman and was also my initial access point. Like you, I was just happy to get time to hang with him. He was cool and he seemed to know all this “stuff.” Eventually, I began handing him tools as I learned what they were called and before long, I was even trusted to measure his cuts (I would find out later just how much this meant to be given such a task by such a man). Anyway… I won’t keep rambling.. I just really felt the need to comment here and tell you what a great post this is and what a great perspective. I first noticed my own son’s interest about a year ago when he started hanging out in my own shop with me and asking me about some of my hand tools that belonged to my grandfather. He was much less interested in what the tool did than the story behind it and I have enjoyed some long nights of stories about my late grandfather and watching his face light up with interest. Not long after these sessions started, he began to show his own general interest in the shop and in the last year, I’m so proud to say that he has taken to it like a duck to water and has shown an obsessive fascination with learning everything he can. Here’s the point of this post… the backfire that I hadn’t been expecting was the fact that his insatiable desire to immerse himself in the shop has, in a very short time, surpassed the amount of hours I have in a day with work and life. As a result, I found him watching youtube videos to supplement our time together. This was great, in theory, but the problem is that a lot of the stuff he is finding is not necessarily teaching him the ways of my grandfather and subsequently the ways of my family traditions. I’m all for shortcuts, but not like that. I began doing my own searching and looking for ways to keep him engaged when I’m not available and I found this: https://bit.ly/2toRL5a Basically, I let him go through and pick things that interest him and we get the plans and he has enough to do in the times I’m unavailable that it leads him to ask me questions and has helped preserve my family traditions with regard to woodworking. I wonder what your thoughts are on this stuff and how you feel about your own family traditions with regard to what you will teach your own. Thanks for having such a cool perspective on all this! « MICROJIG Celebrates 15 Years with $15 Rebate on GRR-RIPPERS!